With the uncontrollable growth of world population, in some parts of the world, millions of people are at the risk of hunger while in certain countries there is a significant waste of food. This imbalance in the global food supply chain increasingly demands sustainable management to “end hunger,” as envisaged in the sustainable development goals. 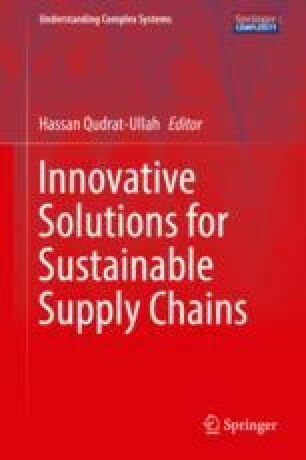 Considering the importance of food supply chains, the purpose of this chapter is to provide an overview of sustainable food supply chain management and to propose an integrated framework. With this objective, the chapter provides an overview of sustainable development and the importance of food supply chain management to address the global food crisis. It also provides an overview of the theoretical background of sustainable food supply chains. The chapter also presents an integrated framework for sustainable food supply chain management by extending prior work on the subject. In every section, carefully selected mini cases are provided to bring in more insights into the points/arguments mentioned therein. Coles. (2017). Corporate responsibility. Available via https://www.coles.com.au/corporate-responsibility. Accessed 29 May 2017. Food Security Information Network (FSIN). (2017). Global report on food crises 2017. FSIN. Available via http://documents.wfp.org/stellent/groups/public/documents/ena/wfp291271.pdf?_ga=2.68548753.189487937.1496587970-882440612.1496587970. Accessed 10 June 2017. Holt-Giménez, E. (2008). The world food crisis: What is behind it and what we can do. Available via http://www.worldhunger.org/world-food-crisis/. Accessed 14 Feb 2017. Institute of Hazard Risk and Resilience (IHRR). (2013). Food crisis? The real problem is poverty. Global Policy Journal. Available via http://www.globalpolicyjournal.com/blog/22/07/2013/food-crisis-real-problem-poverty. Accessed 10 May 2017. Jaspars, S., & Wiggins, S. (2009). The global food crisis: An overview. Available via http://odihpn.org/magazine/the-global-food-crisis-an-overview/. Accessed 10 May 2017. Johnson, C. N. (2002). The benefits of PDCA, quality progress. Available from: http://asq.org/quality-progress/2002/05/problem-solving/the-benefits-of-pdca.html. [12 May 2017]. Our World. (2008). Africa and climate change. Available via https://ourworld.unu.edu/en/africa-and-climate-change. Accessed 18 May 2017. The Conversation. (2015). Climate change is hitting African farmers the hardest of all. Available via http://theconversation.com/climate-change-is-hitting-african-farmers-the-hardest-of-all-40845. Accessed 28 April 2017. UNICEF. (2015). Eradicate extreme poverty and hunger, millennium development goals. Available via https://www.unicef.org/mdg/poverty.html. Accessed 13 April 2017. United Nations (UN). (2016). Zero hunger: Why it matters? Available via http://www.un.org/sustainabledevelopment/wp-content/uploads/2016/08/2_Why-it-Matters_ZeroHunger_2p.pdf. Accessed 22 May 2017. United Nations (UN). (2017). Goal 2: End hunger, achieve food security and improved nutrition and promote sustainable agriculture. Available via http://www.un.org/sustainabledevelopment/hunger/. Accessed 16 May 2017. United Nations Development Program (UNDP). (2017a). Goal 2 targets. Available via http://www.undp.org/content/undp/en/home/sustainable-development-goals/goal-2-zero-hunger/targets/. Accessed 06 June 2017. United Nations Development Program (UNDP). (2017b). Sustainable development goals. Available via http://www.undp.org/content/undp/en/home/sustainable-development-goals.html. Accessed 20 Feb 2017. Verisk Maplecroft. (2016). Africa’s agriculturally dependent nations facing highest costs of climate change. Available via https://maplecroft.com/portfolio/new-analysis/2016/12/18/study-africas-agriculturally-dependent-nations-facing-highest-costs-climate-change-key-agri-commodities-risk/. Accessed 12 June 2017. World Food Programme. (2017). Climate impacts on food security. Available via https://www.wfp.org/climate-change/climate-impacts. Accessed 10 June 2017.